A Russian Soyuz 2-1A rocket lofted the latest Progress resupply vehicle (M-27M) for what was supposed to be a fast rendezvous trip to the International Space Station (ISS). The launch of the Progress – riding on a Soyuz 2-1A for the first time – occurred at 07:09 GMT on Tuesday from the Baikonur Cosmodrome in Kazakhstan. However, numerous problems have resulted in what is now a lost vehicle, as it was seen spinning wildly on orbit. Russia’s Soyuz-2-1A rocket was used to launch the resupply vehicle for only the second time, taking over from the Soyuz-U that launched the previous Progress. This rocket’s fairing included a design to mark the 70th anniversary of the end of World War II, or the “Great Patriotic War”, as it is called in Russia. The 2-1 version of the world famous rocket first flew in November 2004. Derived from the earlier Soyuz-U and the Soyuz 11A511 before that, the rocket was intended as an eventual replacement for all of the Soyuz and Molniya variants then in service. The Molniya-M was retired from service in 2010 and the Soyuz-2 has already replaced the Soyuz-U for all launches apart from Progress missions to the International Space Station. That was until Wednesday’s mission. The first and second stages of the Soyuz-2-1a burn in parallel; the first stage consists of four strap-on boosters powered by RD-117 engines, clustered around the core, or second stage, which is powered by an RD-118. Atop the core sits the third stage with an RD-0110 engine that injected the Progress spacecraft into its target orbit. 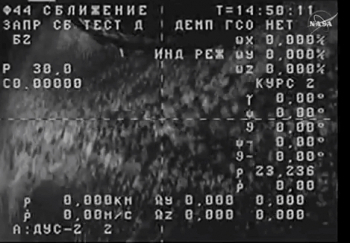 Had all gone to plan, the second orbit would require the help of ground controllers, with actual orbital parameters uplinked from a Russian Ground Site (RGS), allowing for a further eight rendezvous burns to be performed over the next five hours of flight. However, once Progress had arrived on orbit, only confirmation of its solar array deployment and some of the navigational antennas were confirmed. Ratty telemetry resulted in no confirmation of the KURS antennas being deployed. 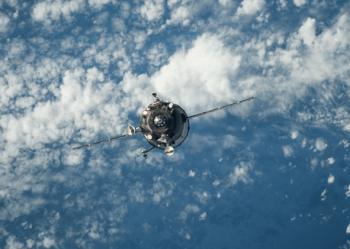 While the fast rendezvous technique has been successfully employed on a number of Progress and Soyuz flights lately, this uncertainty over the KURS system status resulted in Russian controllers opting to move to the traditional two day rendezvous. Controllers had planned to spend those two days troubleshooting the KURS issue. A back up plan would be to dock the vehicle with the TORU system, involving a manual docking, had KURS been confirmed as problematic. However, more problems were noted after the following passes over ground stations, culminating in video from the vehicle showing it is in a wild rotational spin. 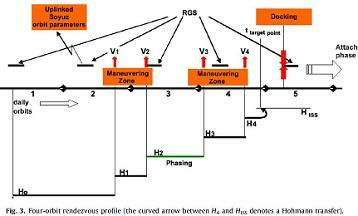 With multiple rate sensor failures, grabbing control of the Progress may be impossible. 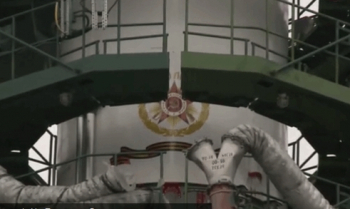 Russian media source Interfax later cited sources saying the problem began with a bad separation between the third stage of the Soyuz carrier and the Progress. More passes over ground stations on Wednesday will determine if they can salvage the mission. NASA noted that a plan to try and communicate with the vehicle would take place in the early hours, Moscow time. The first attempt was later to revealed as unsuccessful. 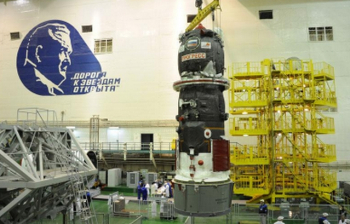 Progress M-27M dock was set to dock with the space station’s Pirs docking compartment later on Tuesday. A plan to dock on Thursday is now also out of the question. A declaration the vehicle is lost was the most likely outcome, with analysis showing the vehicle is under threat of a destructive re-entry if control can’t be established. On Wednesday, officials noted controllers were unable to save the vehicle, declaring a LOM (Loss Of Mission). Its re-entry next month is under evaluation. An investigation will be set up, with the Soyuz 2-1A third stage under the closest scrutiny at this time. For Progress M-27M’s arrival, the usual requirement of bidding farewell to a previously docked Progress was conducted over the weekend. Progress M-25M undocked and moved to a safe distance from the station until it was deorbited on Sunday. The previous Progress enjoyed a stay of execution, undergoing three weeks of engineering tests in orbit before being commanded to reenter Earth’s atmosphere, where it burnt up over the Pacific Ocean. 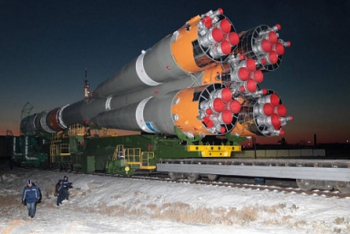 The latest Progress sports an increased cargo manifest, afforded to it via the additional power of the Soyuz 2-1A. Although this is not the primary reason for switching to the Soyuz 2-1A, an extra 400 kg can be lofted via this new partnership, although not all of that additional margin has been taken advantage of with Progress M-27M as such an increase would likely require design changes to the Progress. Progress M-27M has a launch mass of nearly 7,300 Kilograms, the bulk of which is made up of cargo and propellant for the Station. It is also lofting nearly 1,400 kg of dry cargo in its pressurized section. The dry cargo manifest ranges from food and clothing to science equipment and spares.